There are countless advantages of working out. There are physical advantages such as building muscle, increasing strength, flexibility and cardio, and improving performance in athletics. There are health benefits such as reducing the likelihood of coronary heart disease, strokes, or diabetes. However, advantages that are often overlook are those that correlate to the mind and mental health. Studies have shown that regular, consistent exercise has the benefit of increasing memory and brain function, reducing stress, and improving one’s mood. First, the science. The brain’s prefrontal cortex and medial temporal cortex are the parts of the brain that are responsible for our thought processes and memory functions. Research has concluded that these areas have a greater volume in those that partake in regular exercise when compared to those that do not. 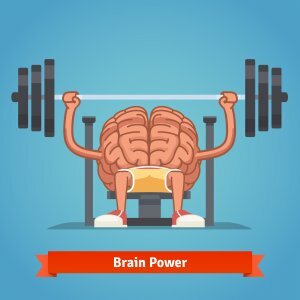 Through exercise the brain is able to stimulate the release of growth factors, or chemicals in the brain. These chemicals contribute to brain cell health, as well as new cell and blood vessel growth. As far as mental health is concerned, even more studies have shown that exercise improves one’s mood, sleep pattern, and reduces stress. If these are unimportant to you then by all means go ahead and close this page and read something else. My bet, however, is that everyone can use some stress reduction, more productive sleep, and more positive temperaments. Exercise can manage anxiety and negative thoughts. Often, individuals tend to manage their daily difficulties in unhealthy ways. Drinking, binge eating, and avoiding others are common ways to cope with negativity or strife. Exercise gets you out of the house. It takes your mind off of negative thoughts and focuses your thoughts on the positive effects of health and exercise. Again this isn’t just here say and theory, there is science. Exercise releases endorphins, which are chemicals in the brain. These chemicals reduce immune system chemicals that lead to depression and increase body temperature. The combination causes a calming effect in the body that directly combats negative thoughts and feelings you may be having. Another way that exercise can help mental health each day is less of a direct combative method and more of an indirect factor. Exercise gives you energy. Not just when you’re working out, but consistent exercise strengthens muscles and increases your endurance. In turn, this improves your cardiovascular system by sending oxygen to your tissues. When cardiovascular capacity is increased and improved, this correlates to an increase in your energy capacity each day. How much more efficient could your day be if you could avoid hitting that 3 pm wall? How much better would your mood be if you don’t find yourself “bleeding into the finish” at the end of each day, feeling physically and mentally exhausted as the day goes on? Exercising doesn’t solve all of life’s problems, and everyone’s struggles are different. I’m not trying to say that when you pick up that first dumbbell or step on the treadmill for the first time you’re going to transform into this bubbly, energetic cartoon of a person. However, scientific research has proven that through regular exercise you can increase brain function. It has proven that exercise will have positive effects on mood, sleep, and energy. It has proven that exercise releases endorphins and reduces stress. It won’t make all your problems go away, but it will equip you with tools to improve your life and make it more positive in some capacity.